Rev. Deacon Val Sloane: Has Christ been divided? Come, bow before him now in reverence and fear. Be still for the presence of the Lord, the Holy One is here. If you look at the cover page of our Order of Service for tonight you will see that our theme is Has Christ been Divided? What a question! A few of you may already have given it some thought. However, I have o doubt that if I asked you to turn to the people around you and ask them this question their responses would be somewhat varied. A further response could be, ‘Well, if we are speaking about it in a spiritual sense then NO but if we speak about it in the sense of the places of worship in a community, then, to an outsider the answer could very well be YES. The picture on the cover of our Order of Service booklet – with the different churches placed around the globe – perhaps actually hints at that. You will be relieved to know that I am not going to ask you to do that. However, you may like to wrestle with the question sometime. What we really have to do is to look at the Question in its context. Paul is writing to the Corinthians seeking to address the divisions in the Church. He has just appealed to them in Jesus’ name that all of them be in agreement and that there be no divisions among them – indeed that they be united in the same mind and the same purpose. He does this because he has heard that there are quarrels among them. It has come to light that people were claiming allegiance to different leaders – Paul, Apollos, Cephas, Christ. It is in this context that Paul asked – Has Christ been divided? Followed by Was Paul crucified for you? Or were you baptized in the name of Paul? In asking these questions, Paul is highlighting to the Corinthians that it was Christ and Christ alone who had been crucified for them and in whose name they had been baptized. Paul did not want the cross of Christ to be emptied of its power (1 Cor. 1:17). Neither, I believe, do we: For ‘the path to unity is to be found in the power of the Cross.’ (Week of Prayer – Biblical Reflections and Prayers p.11) – A little gem. In preparing my thoughts for this reflection it came to me that in one sense we do not need to be taught afresh the truth of God’s word from the Scripture readings we have heard this evening for each truth has been instilled in us over the years of our faith journey. 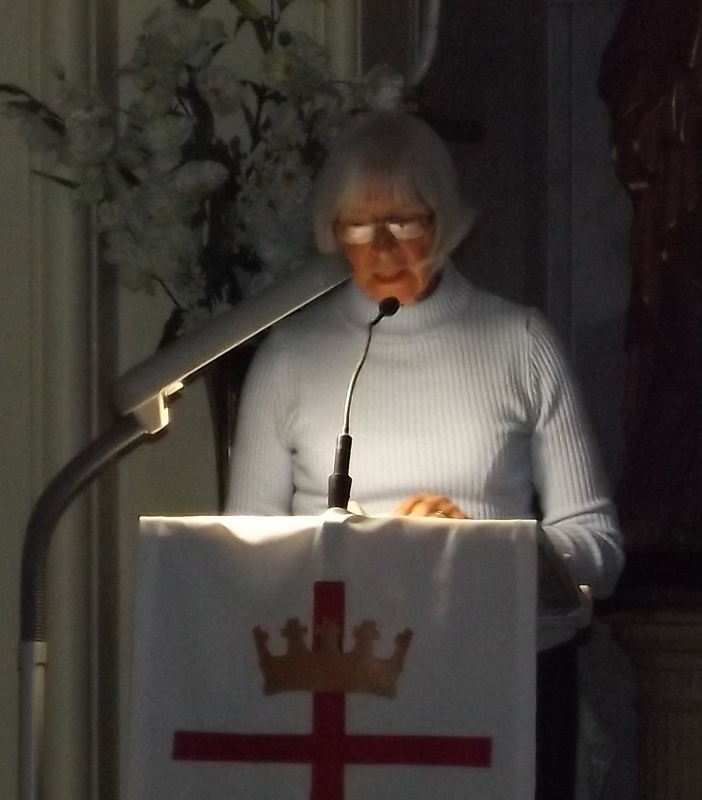 Rather, what we need, is to avail ourselves of the key that has been given to us to unlock the truth not only for the faith community, but for the community of Corowa as a whole and so enable God’s love to be fully known. We’ll look at this more closely later on. If the path to unity is to be found in the power of the cross, how does that power manifest itself? In Ephesians 2:14 we learn that Jesus’ death on the cross has the power to break down hostility between people; this was referring to the hostility between the Jews and the Gentiles. Verse 15 says and I quote ‘(Jesus) abolished the law with its commandments and ordinances, that he might create in himself one new humanity in place of the two, thus making peace, and might reconcile both groups to God in one body through the cross, thus putting to death that hostility through it’ – end of quote. A new humanity is created in Christ – hostility is put to death through the cross. Hostility is ended and peace is made – through the power of the cross. Jesus has accomplished our reconciliation with God and with one another through his death on the cross and his love for humanity. – We need to accept it and allow it to manifest itself in our midst. Reconciliation happens primarily when our relationship with God is restored by accepting his gift of grace and mercy through Jesus Christ his Son. Our relationship with God manifests itself outwardly by the way we live, but this outward manifestation comes from an inner transformation which takes place in our heart. A wonderful example of this was seen last night by all who witnessed the performance of the Watato children’s Choir from Uganda, Africa. The faith of the children shone from their faces and was very evident in their songs of worship. So often they would place their hand on their heart when they spoke about what Jesus has done for them. The heart is mentioned in the Ezekiel reading this evening which speaks about the Renewal of Israel. What did God say to the house of Israel through the prophet? Listen! Friends – Our inner transformation has its beginning with a new heart … not a new physical heart, but a heart that is for God alone! We cannot give ourselves a new heart or put a new spirit within us, for this is the work of God and God alone. Nicodemus, a man who came by night to talk with Jesus, discovered to his surprise that no one can see the Kingdom of God without being born of water and the spirit. In a spiritual sense I believe the prayer Jesus prayed is being answered. But it is as we seek to manifest this oneness in our daily life, having in mind myself in particular – that we often fall short of the mark. What so often gets in the way – for me at least – is the “self.” And it is at this point that I wish to share part of my own faith journey with you in discovering the key that has been given to us to unlock the truth of God’s Word and so enable God’s love to be fully known and Jesus’ prayer to become a reality in our midst. It was in the 1960’s whilst at Teacher’s College that I made a commitment of my life to God and began a faith journey that has continued over the past 50 years. At a small group Bible Study I attended in the early seventies, I shared that I didn’t experience the love, joy and peace that we read about in the Scriptures. It was from then on that I began to read a lot more about the Christian faith and the Holy Spirit in particular. By the 1980’s I had come to a point in my faith journey where God chose to challenge what I believed. I believed and acknowledged that Jesus was my Saviour and Lord. God however, knew me far better than I did myself and challenged me about His Lordship in my life, highlighting that in fact – His Lordship in my life was only in theory. I was saying that He was Lord, but in reality I was the one still making all the decisions in regard to my life. I have to confess that at the time (and some, close to home I might say, and even today!) I was a very strong-willed person and didn’t really like anyone telling me what to do – not even if that Someone was God. For days I wrestled with what God was asking of me – the yielding of my self-will to Him. Ultimately, after three weeks, I came to the point of recognizing that as things stood, I was not happy with my life as it was; so what did I have to lose? It was then that I yielded my self-will to God’s will and He became my Lord. I asked God to fill me with His love that I may love Him as I ought, to open my lips that my mouth would show forth His praise and to release His Spirit within me. In the weeks that followed God filled me with a deep love for people and a deep peace within. Friends, I believe that the key that has been given to us to unlock the truth of God’s Word and enable Jesus’ prayer to become reality in our midst is the Holy Spirit. In the chapters just before Jesus’ prayer “that all may become one”, He speaks to the disciples about asking the Father for another Advocate to be with them forever – “the Spirit of truth”, the Holy Spirit who will teach the disciples everything and remind them of all Jesus has said. And so we come to Pentecost – and the outpouring of the Holy Spirit. Pentecost saw the fulfilment of Jesus’ promise: the coming of another Advocate, the Holy Spirit, who would empower the disciples to witness and minister in Jesus’ name. The Holy Spirit not only empowered the disciples for ministry but the Holy Spirit was also the means by which God’s love was poured into their hearts and indeed into our hearts today. It was love, the love of one another that was the distinguishing factor of the early Church. May ‘love’ and the love of one another be the distinguishing factor of the Church in the 21st century, especially the Church in Corowa. It is some years ago now since God showed me that love has a flipside, and that the flipside of ‘love’ is forgiveness. I had to learn, and am still learning, that if I truly loved someone I would forgive them and if I forgave someone then they would know that I truly loved them – a powerful thought but so relevant to the concept of unity. Let us go from here tonight with this key thought “the path to unity is to be found in the power of the Cross” – and could we say that the power of the Cross can be summed up in two words – LOVE AND FORGIVENESS? “The glory that you have given me I have given them, so that they may be one, as we are one, I in them and you in me, that they may become completely one, so that the world may know that you have sent me and have loved them even as you have loved me.” …To the glory of God. Amen. our radiant King of light.